Multiple sclerosis (MS) is an unpredictable and debilitating neurodegenerative disease that affects an estimated 300,000 to 400,000 individuals in the United States and 100,000 Canadians. Typically, Magnetic Resonance Imaging (MRI) is used to confirm diagnosis, but current techniques are limited in their ability to detect subtle differences in tissue damage. Recent research at the University of Calgary’s Hotchkiss Brain Institute (HBI) is focused on enhancing the diagnostic and therapeutic power of Magnetic Resonance Imaging (MRI) with a new technique that can sense very small changes in patterns within the MRI images of MS patients. In a study published in the journal Annals of Neurology, the HBIs Dr. Yunyan Zhang and colleagues have developed a mathematical algorithm that they used to analyze MRI images from MS subjects. They found that by applying this algorithm, they could look at a parameter called MRI texture heterogeneity and clearly see patterns and changes in tissue samples. The Annals of Neurology paper, titled “Pathological correlates of magnetic resonance imaging texture heterogeneity in multiple sclerosis” (Volume 74, Issue 1, pages 9199, first published online July 2013 doi: 10.1002/ana.23867), is co-authored by Yunyan Zhang MD, PhD, G. R. Wayne Moore MD, FRCPC, FRCPath, Cornelia Laule PhD, Thorarin A. Bjarnason PhD, Piotr Kozlowski PhD, Anthony Traboulsee MD, FRCPC, and David K. B. Li MD, FRCPC, variously of Departments at The University of Calgary, Calgary, Alberta; the University of British Columbia, Vancouver, British Columbia, and the Department of Diagnostic Imaging Services, Interior Health, Kelowna, British Columbia. The study abstract notes that in order to analyze the texture of T2-weighted magnetic resonance imaging (MRI) of a postmortem multiple sclerosis (MS) brain, and to determine whether and how MRI texture correlates with tissue pathology, the research team examined ten brain samples from 3 subjects with MS. Areas of complete, partial, or no loss of Luxol fast blue (myelin) and Bielschowsky (axons) staining were marked on histological images, and matched on corresponding MRI as lesions, diffusely abnormal white matter (DAWM), and normal-appearing white matter (NAWM). The number of CD45+ cells (inflammation) was also counted. 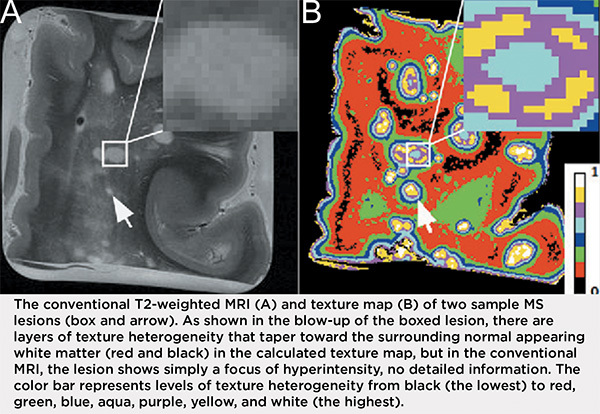 MRI texture was computed using polar Stockwell transform and compared to histology. Thirty-four lesions, 17 DAWM regions, and 36 NAWM regions were identified. In MRI, a gradient of texture heterogeneity was detected in lesions, with gradual tapering toward perilesional NAWM. Moreover, besides univariate correlation with histological markers, texture heterogeneity correlated independently with normalized myelin density (p < 0.01) when random effects were considered. Within sample, MRI texture correlated with myelin and axonal density in 7 of 10 samples (p < 0.01). The researchers conclude that texture analysis performed on routine clinical magnetic resonance images may be a potential measure of tissue integrity, and that issues with more severe myelin and axonal pathology are associated with greater texture heterogeneity. “An MRI image has a texture that you can’t normally see with your eyes,” explains Dr. Zhang, a Research Assistant Professor in the Departments of Clinical Neurosciences and Radiology, in a University of Calgary release “This computer algorithm calculates how the image elements are organized. It allows us to see changes in the texture pattern that correspond to areas of damage and it clearly shows boundaries between damaged and normal tissue reports. When looking at the MRI image of an MS patient that has been analyzed with Dr. Zhang’s algorithm, the image shows the amount of coarse texture or fine texture that is present. Dr. Zhang found that areas with the most coarse texture or heterogeneity corresponded with the greatest amount of damage. 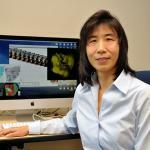 When compared to a traditional MRI image, Dr. Zhang’s texture map reveals much greater detail, making it a very powerful tool for assessing and diagnosing disease. The release notes that potential applications for this technology are far-reaching. Dr. Zhang hopes her algorithm will one day prove beneficial for assessing the efficacy of treatment, or for testing new drugs. If we can compare a scan from a patient prior to treatment with a new scan during treatment, the algorithm will give us a clear picture of the actual extent and location of repair. In addition, Dr. Zhang believes this technique could also be applied in cases of other neurodegenerative diseases such as Alzheimer’s disease and even in concussion or other brain injury. “This study has confirmed that our technique is a sensitive tool,” says Dr. Zhang. “Now we know that tissue heterogeneity corresponds with damage and we can work on increasing the accuracy of the algorithm and exploring other potential applications for it.” It’s a quick, non-invasive technique that Dr. Zhang hopes could one day become standard in the diagnosis and treatment of MS and other neurodegenerative disorders. This study was funded by the Natural Sciences and Engineering Research Council of Canada (NSERC), MS Society of Canada, Alberta endMS Network, and the HBI MS Program. Collaborators include Drs. V. Wee Yong and Luanne Metz, co-directors of the HBI MS Program, and partners at the University of British Columbia. – Research teams seek to understand how central nervous system function is lost, how damage can be prevented, and how repairs can be made. Some of the disorders being studied include: multiple sclerosis (MS), spine and peripheral nerve damage, stroke, and movement disorders like Parkinson’s disease. – New management and treatment approaches are being developed as researchers work to understand disorders within the mind, such as psychosis, depression, and epilepsy. – Researchers are achieving new levels of precision with neurological procedures by developing and using new advanced imaging techniques and robotic technologies. Neuroscience is a rapidly evolving science, with recent discoveries that are improving the lives of many suffering from debilitating illnesses, and the Hotchkiss Brain Institute is a world leader in aligning scientists and clinicians to coordinate their research, and, ultimately, enhance patient care.